Well, I have never shelled so many boiled eggs in my life - not even when helping my parents catering for weddings as a child. I boiled and shelled, boiled and shelled and boiled and shelled until I was utterly sick of looking at eggs! And then the good happened: I succeeded. What a relief. Mind you, there was work to be done because I also had about 60 failures to clean up. That’s right, I’d created a food mess from roughly 5 dozen hens’ eggs which I’d boiled but which I had not been able to shell quickly enough to qualify. Yet, there was one advantage to having so much world record attempt collateral around… I could eat some of it. Lovely. So in the days after my many egg-shelling attempts, I ate – well, guess. That’s right, I ate egg sandwiches, boiled eggs on toast, boiled eggs on their own, egg salads and any other dish I could make using egg. Oh dear. I can now honestly say I’ve eaten my share of eggs for the year. I don’t mind, because they were special eggs for me. And what I just couldn’t stomach, I gave to my friends. So now a whole lot of us have had enough of eating eggs. That is only the end of a rather long story. So let me begin at the start. You see, I’ve tried this business of shelling eggs before: once in the southern hemisphere, and once in the northern hemisphere. I don’t often try to beat myself at world records, because I enjoy moving onto new things. But not for eggs! I simply had to do better than I’d managed in the past. I thought very carefully about re-attempting this, casting my mind back to the troubles I’d had in the past. I’ve learned that although I may be able to shell an egg very fast, somehow things hadn’t worked out for me when I was being filmed during my official world record attempts. That’s the way life goes, I suppose. I recall that the slightest errors caused me to underperform in my previous attempts, including the age of the eggs others chose on my behalf, how they were boiled, their shape, what the hens ate and more. I was aware that supermarket eggs are usually from battery farms where hens are treated with great cruelty and not fed as they should be, and this affects the makeup of their eggs’ shells. I suspected that was why some eggs were inexplicably tough to shell, and perhaps why I hadn’t been able to shell one at impressive speed on camera. I wanted to source at least some free-range certified organic hens’ eggs, hoping they’d shell more easily and because I don’t want to support those who are cruel to animals. And so I kept planning. This time, though, I was going to try until I succeeded. That meant the kitchen smelled of eggs for half the day after I’d been there, and the compost bin was topped with a mass of organic and non-organic eggshells. I’d chosen eggs of the right age, some from a source I thought would have contributed to the kind of eggshell formation that is easily removed, and boiled them all extremely carefully. But still, I failed and failed and failed. It appeared that this particular world record would only come my way by sheer luck. Call it what you will, but I got it – after hogging the kitchen for hours. It seemed the eggs were determined not to be shelled, and so I repeated my attempts until I lost count. 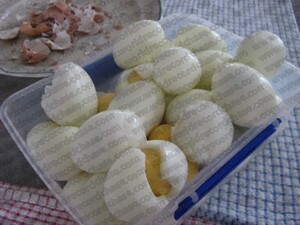 There was no need to count anyway; I was gradually filling up 2 large plastic containers with broken and whole shelled eggs. It was very clear I was running out of space in the fridge. That’s when I began eating egg after egg to get rid of them!. Then, to my surprise, I launched into the routine once more and – for reasons I can’t explain, the shell just peeled off easily in large sections. I tossed the slippery white egg onto the cloth in front of the plate immediately, and raised my hands into the air to signal I’d completed the job. But had I done it? I was quick to watch my own video to satisfy my curiosity. I was confident I’d shelled that egg in record time. But I would need to wait for the judges to decide, and so I did what’s required. I waited some time, all the while eating my way through eggs and watching my friends do the same. And then I got the judges’ decision – awesome! After my repetitive efforts, I had made it into the record books once again. What a pleasure. Do you have any idea what it’s like to shell egg upon egg until you’ve seen so many, you despise them? Just ask me; I know. But the good news is that I also know what it feels like to rise over a challenge victoriously… as I did in overcoming eggs that try to refuse to become world record holders for being shelled.